London and Xanten 21 March 2019: The Commission for Looted Art in Europe (CLAE), representing the heirs of Gottlieb and Mathilde Kraus, and the Verein zur Erhaltung des Xantener Domes e.V. 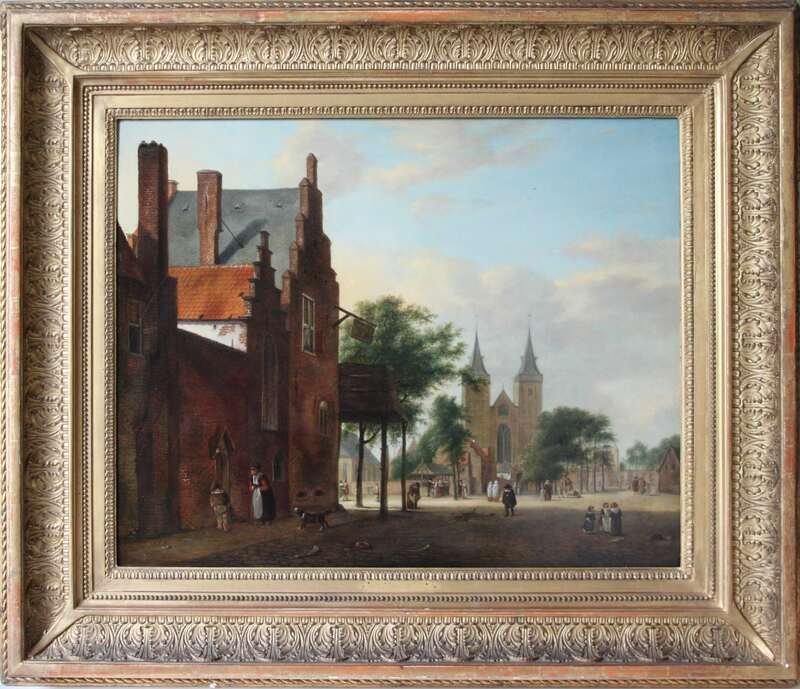 (Association for the Preservation of the Xanten Cathedral), Germany, are pleased to announce the return of the painting ‘View of a Dutch square’ attributed to the Dutch 17th century painter Jan van der Heyden, to the heirs of Gottlieb and Mathilde Kraus, who fled Vienna in April 1938 to escape from Nazi persecution. Gottlieb Kraus (1867-1952) was a businessman and honorary consul for Czechoslovakia in Austria. Beginning in the early years of the 20th century, he and his wife Mathilde (1873-1954) assembled a notable art collection of over 160 paintings, and in 1923 their apartment at Vienna IV, Wohllebengasse 16/5 was opened as a museum so that it could be publicly displayed. The collection included the painting ‘View of a Dutch Square’ attributed to the Dutch Old Master, Jan van der Heyden. Following the so-called ‘Anschluss’ with Germany in March 1938 and the persecution of the Jews by the Nazis, Gottlieb and Mathilde Kraus fled via Prague to the USA, leaving their entire art collection behind in Vienna. On 13 June 1941 all their property, including the art collection, was confiscated by the Gestapo. On 8 July 1942 the Van der Heyden painting was sold by the Gestapo to Heinrich Hoffmann, Hitler’s friend and photographer, and father-in-law of Baldur von Schirach, the Nazi Governor of Vienna. In May 1945 the Hoffmann art collection was found by Allied officers at Schloss Dietramzell, Bavaria, and sent to Munich where it was inventoried and photographed. In March 1959 the Van der Heyden painting and other paintings were transferred by the Allies to the State of Bavaria with specific reference to the restitution obligation. The Van der Heyden painting subsequently entered the Bavarian State Paintings Collections in Munich as inventory no. 12891. After the war the Kraus family made efforts over many decades with the governments of both Germany and Austria to find and recover their art collection, but without success. Of the family’s over 160 seized paintings, the Van der Heyden is only the seventh painting to be recovered by the family since 1945, the previous six being returned by Austria in 2002 and 2004. When researching the paintings, the Commission for Looted Art in Europe discovered that in March 1962, the Van der Heyden painting had been handed over by the State of Bavaria to Mrs Henriette Hoffmann-von Schirach, daughter of Heinrich Hoffmann, as a ‘return sale’ (Rückkauf). This led to the discovery that many paintings and other cultural items were secretly returned by Bavaria to families of high-ranking Nazis over a period of some 20 years after the war. This remarkable scandal has been the subject of an investigation in the Bavarian Parliament, leading to a report by the Bavarian Culture Minister. An in depth German-government funded investigation is to be published shortly. The Van der Heyden was returned to Mrs Hoffmann-von Schirach in March 1962 in exchange for the sum of 300 DM. On 14 November 1963, Mrs Hoffmann von Schirach sold the painting through the Lempertz auction house in Cologne for 16,100DM. The Dombauverein Xanten in North Rhine-Westphalia bought the painting at Lempertz without knowledge of the fact that the painting had previously belonged to the Kraus family. The painting depicts St Victor, the cathedral church of Xanten, and has hung in the Cathedral chapter house which houses the Cathedral Association since 1963. In 2011 a restitution claim for the painting was submitted to Xanten by the Commission for Looted Art in Europe on behalf of the Kraus family. Following the recent agreement, the Dombauverein Xanten is now returning the Van der Heyden painting to the Kraus heirs in recognition of its expropriation from Gottlieb and Mathilde Kraus as a result of Nazi persecution of the Jews. “In a real sense, my family has been waiting for this moment for eighty years, when Gottlieb, Mathilde, and Marie Kraus fled Vienna with their lives and little else, and left their beloved art collection to an uncertain fate. On behalf of my uncle Alex, the last person alive who knew Gottlieb in Vienna, and the extended Kraus family, and for those who are no longer with us: Gottlieb, Mathilde, Lily, Marie and Gladys, I want to express my deep appreciation to Anne Webber and the Commission for Looted Art in Europe, without whom this day would never have arrived. I also want to extend my thanks and appreciation to Herr Barking, and the Dombauverein for their diligent care and custody of the painting and for their willingness to reach this fair, just and proper resolution. "It is good to first of all note that by handing over the looted painting to the heirs of the Kraus family today, the Xantener Dombauverein can make a small contribution, within the scope of its possibilities, to making good the injustice done by the Nazi criminals after more than 80 years. No member of the board of the Xanten Cathedral Association could have imagined, when taking up his position on the board, that any question of looted art from the Nazi era would arise. It is to be noted that no member of the board lived in the Nazi period themselves. The Dombauverein has decided to surrender the painting, which was acquired at an auction at the Lempertz auction house in Cologne in 1963 for 16,100.00 DM (more than the equivalent value of a new Volkswagen today), although the Dombauverein was not legally obliged to do so. International agreements on the restitution of looted art, in particular the Washington Agreement and other intergovernmental regulations, do not apply to the Xanten Cathedral Association as a non-profit, court-registered association under civil law. However, the Cathedral Association did not want to invoke this because of the crimes committed against Gottlieb and Mathilde Kraus and their family. At the suggestion of the Board of Directors, the General Assembly of the Cathedral Association repeatedly and unanimously endorsed this view and this procedure. I ask for your understanding that I have certain difficulties in speaking of a "return" of the painting. This term may imply that the Dombauverein may not have acquired the painting lawfully and may not have become the lawful owner. I therefore prefer the term "surrender", which is done voluntarily in recognition of the Nazi injustice. Finally, I would like to make the following personal comment: Since 1962, my deceased parents and "we children" have been friends with a large Jewish family from France and still are today. The members of this Jewish family live today in Paris and also in the Ruhr area. Due to this friendship it has always been important for me to reach a good and consensual settlement for all involved." “Almost 75 years after the end of the war, and even in such a clear-cut case as this, there is in Germany still no obligation to return Nazi looted art, despite many statements of intent from the German authorities. We appreciate that the Xanten Dombauverein has finally taken the decision to return this painting to the Kraus family, and hope that it will set an example to other institutions and foundations in Germany. The story of this painting is particularly shocking, having passed, after seizure in Vienna in 1941, through the hands of the leading Nazis into one of their private collections. Found by the Allies and handed over to Bavaria after the war for the purpose of restitution, it was instead returned by Bavaria not to the rightful owners but to the leading Nazi family in whose possession it had been found. The Commission for Looted Art in Europe (CLAE), is an international, expert and non-profit representative body based in London which negotiates policies and procedures with governments and cultural institutions and promotes the identification of looted cultural property and the tracing of its rightful owners. It represents families from all over the world, acting on their behalf to locate and recover their looted artworks. It has been instrumental in the return to its rightful owners of over 3,500 items of looted property since it was set up in 1999. It also provides a Central Registry of Information on Looted Cultural Property 1933-1945 at www.lootedart.com to fulfil Washington Principle VI which called for the creation of such a repository of information. The Xanten Dombauverein is a politically neutral, legal body founded in February 1928 and registered in the Rheinberg District Court. It is recognized as a non-profit organization under tax law. According to its statutes, the Association has the particular task of preserving the gothic cathedral of St. Viktor, which is under a preservation order.. For this purpose, the Dombauverein maintains a workshop with expert staff to carry out conservation and restoration at the cathedral.